system throughput (20 Gbps ingress and 20 Gbps egress) while ensuring SDH/SONET-like performance and Five Nines reliability. ETX-220A can deliver IP VPN, VoIP, and dedicated Internet access over the same physical link as a Layer-2 LAN-to-LAN service, all with differentiated quality of service and end-to-end monitoring. 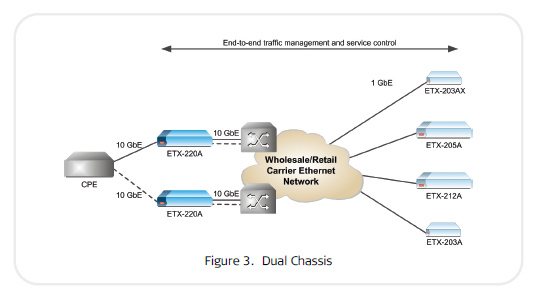 • Dual chassis – ETX-220A provides end-to-end traffic management and service control with redundancy (see Figure 3). 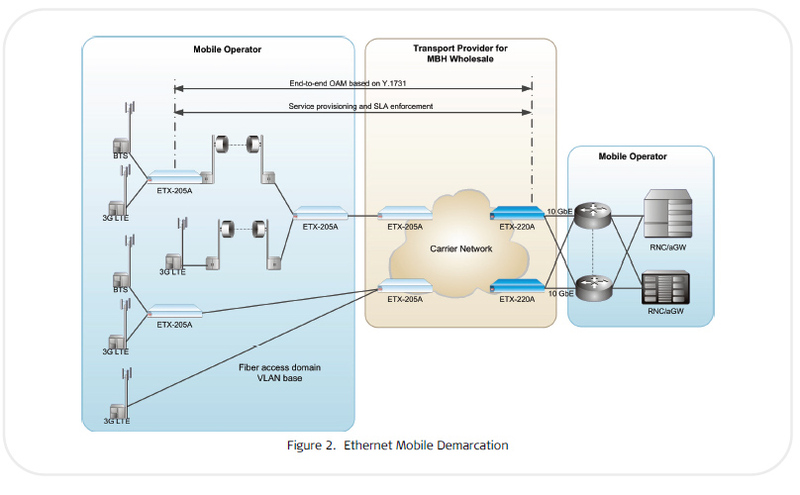 • Ethernet Virtual Private Line (EVPL) – ETX-220A delivers site-to-site connectivity over shared bandwidth with service multiplexing. More classification criteria and combinations can be found in the user manual. as per service. QoS has three aspects: rate limitation, traffic shaping, and traffic prioritization. Traffic policing is applied per flow or group of flows, and operates according to the dual token bucket mechanism based on user-configurable CIR + CBS and EIR + EBS. Traffic can be limited to the line rate or the data rate. The queues handle traffic with different service demands, such as real-time traffic, premium data, or best-effort data. The RAD ETX-220A uses the WRED policy to ensure that in case of congestion, green packets are not dropped (yellow packets may be dropped). Every flow per EVC or EVC.cos has its own queues and scheduler. ETX-220A supports up to 320 flows, and a total of 64 queue blocks per network/user port, enabling shaping of the EVCs. Each queue block is a group of eight queues per CoS.
continuity across color-aware (Drop Eligible-enabled) as well as color-unaware networks. (IEEE 802.3-2005 and LACP), or to discard the L2CP frames. The ETX-220A provides a built-in RFC-2544 wirespeed traffic generator and analyzer for unidirectional and bidirectional testing of throughput, latency, and frame loss. The tests are performed over Layer-2, based on standard OAM messages, and can be performed for multiple flows. through Ethernet bridges (MAC address) and routers (IP address). 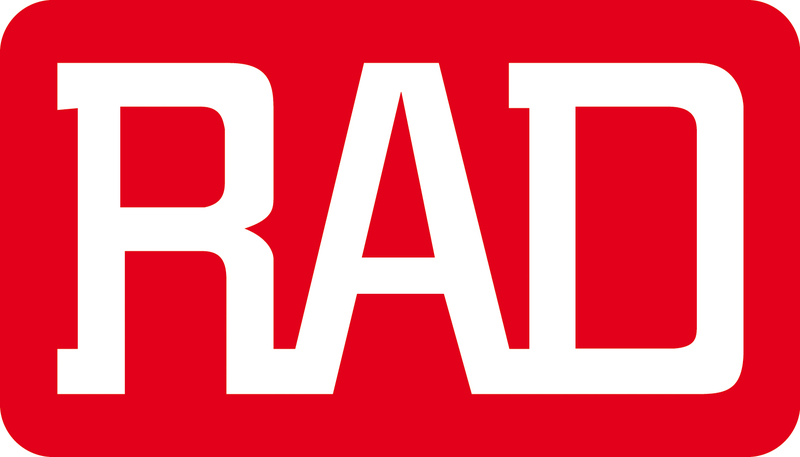 The RAD ETX-220A supports large frames of up to12 Kbytes. • Single-segment (link) OAM according to IEEE 802.3-2005 (formerly 802.3ah) for remote management and fault indication, including remote loopback, dying gasp, and MIB parameter retrieval. Active and passive mode are supported. • Loopback testing at line rate. 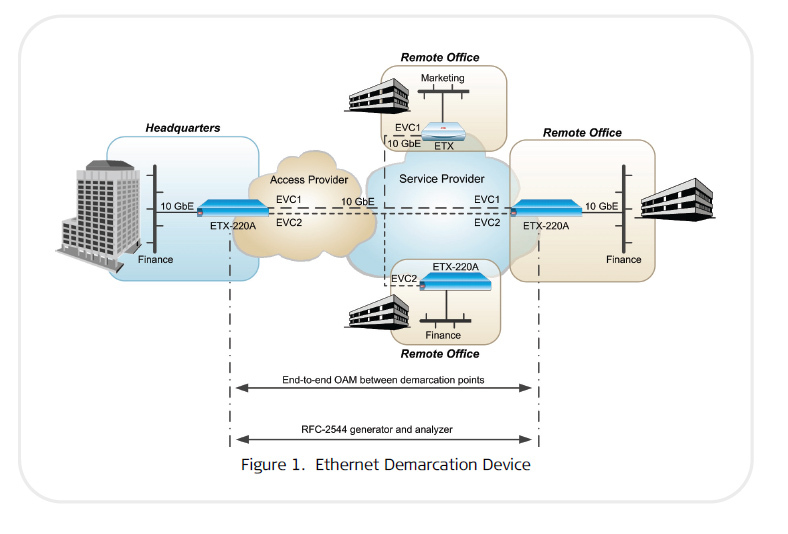 service performance by combining Ethernet aggregation with OAM and SLA enforcement capabilities. and switches connected to both ends of the link to reroute the traffic to the redundancy path. • Dual homing (1:1), allowing ETX-220A to be connected to two different upstream devices. properly disconnect from the network with notification of the reason for the service problem. ETX-220A/H is a temperature-hardened version with matching SFPs intended for industrial installations. • SFTP – Secure File Transfer Protocol. • SSH for Secure Shell communication session. IP address, IP mask, and default gateway can be automatically obtained using DHCP.